If you want your family’s photo greeting card to impress your friends this holiday season, here are 10 helpful suggestions from professional photographers Michele and Tom Grimm, authors of a brand new handbook, The Basic Book of Digital Photography. Plan Ahead. Eye-catching photos take some thought, so envision the card you want to send before you take any pictures. Pick a setting with an uncluttered background. Decide what type of clothes to wear (causal or dress-up?) and what colors might be appropriate (red and green will enhance a Christmas theme). If you want to shoot outdoors, consider the weather and the time of day for the best light. Cloudy or overcast days are perfect for portraits without shadows; avoid bright sunlight that causes people to squint. Get Your Camera Ready. Be sure to install new or freshly-charged batteries so the camera won’t stop working in the middle of your shooting session. Also check that there is room on the memory card to hold plenty of new exposures. And remember to carefully clean the camera lens of dust and fingerprints; use a microfiber lens cloth. For pictures of the best technical quality, adjust the camera’s “image quality” and “image resolution” to their highest settings. Finally, make certain the “date/time” setting is turned off so those numbers won’t appear on the front of your family and ruin every picture. Move in Close. Remember that friends mostly enjoy seeing the faces of your family and pets. Get close to them by moving the camera physically closer or adjusting the zoom lens to fill the viewfinder or LCD monitor with their faces. Aim the camera’s autofocus target on the eyes; be careful it isn’t pointed between the heads of people because the background will be in focus instead of the family’s faces. Also, make sure there are no windows or mirrors in the background that are distracting or cause reflections, especially if you are shooting with flash. Forget About Red-eye. If the sun is causing shadows on the faces of your family, or you are shooting indoors in dim light, we recommend using the camera’s built-in flash or an external flash unit to provide “fill” light that illuminates your subjects more evenly. Avoid the “red-eye reduction” flash setting, if your camera offers it, because this makes a series of pre-flashes or a steady light that causes some people to blink or shut their eyes. “Red-eye,” an annoying bright red spot occasionally seen in the pupils of the eyes, is easily eliminated later with your computer’s image-editing software. Use a Tripod, and a Friend. Put your camera on a tripod so it will remain in the same position after you compose the family picture. Recruit a friend to trip the shutter release instead of using a remote control or the self-timer to fire the camera yourself. Remind everyone to keep looking toward the camera and not glance away to see if the baby or dog is behaving; depend on your friend to snap the shutter when everybody looks their best. Keep On Shooting. Someone in the family group is certain to blink, yawn, scratch or look away just as a picture is taken, so shoot again and again. One of the joys of digital photography is that it costs nothing extra to make a dozen or so exposures rather than just one or two. A warning: Your subjects will quickly get restless, so don’t spend time between shots checking images on the camera’s LCD monitor to see how they turned out. Pick the best image later when you view all the shots at full size on your computer. Create a Collage When Family Members are Absent. Can’t get everyone in your family together for a holiday card photo? A solution is to get and assemble individual photos of each family member into a collage or montage that becomes a single image. Many image-editing software programs — probably including the one that came with your camera — have a feature for easily merging photos. First choose a template from various designs that hold different numbers and sizes of images, then arrange your family’s photos as you like. Dress Up Your Holiday Photos with Borders and Type. Your computer’s image-editing software also enables you to add borders and to type captions that become part of the family’s holiday photo. Pick a border with a design and colors appropriate for the season. You can select different typefaces, sizes and colors, and position the text wherever you wish in the picture. Also, local and online photo centers offer holiday-themed templates for greeting cards that are easy to fill in with your own photos and text. Print Your Own Holiday Photo Cards. Remember to design your photo card so it can be printed on standard sizes of photo paper and will fit in standard-size envelopes. To save money, select a “Picture Package” in your image-editing software to make several prints on one piece of photo paper — such as two 5 x 7-inch or four 4 x 5-inch prints on a single 8-½ x 11-inch sheet — and cut them apart. Also consider HP Holiday Photo Card packs with 20 sheets of 5 x 7-inch glossy photo paper and matching envelopes for $9.99. An Easier Option: Order Your Cards at a Photo Center. If your mailing list is large, it usually is more convenient and economical to have your holiday photo cards printed at a local or online photo center. Many allow you to upload the photo image file online to a selection of card templates that you can personalize with family names and greetings. The cards and envelopes can be picked up a few hours later, or will be mailed to you. Search online for “photo greeting cards” to find a wide choice of photo-finishing companies, including shutterfly.com, snapfish.com, and photoworks.com. 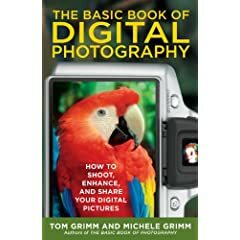 Tom Grimm and Michele Grimm, authors of The Basic Book of Digital Photography: How to Shoot, Enhance, and Share Your Digital Pictures, are a husband-and-wife photojournalism team who have spent nearly four decades traveling the globe in search of the perfect photographic image. Their photographs and articles have been published worldwide in magazines and newspapers and on the Internet. The Grimms are authors and illustrators of thirteen adult and children’s books.